It's a supremely silly but heartwarming tale of fame, fortune, loneliness and love that sees your pet jetting off to Petlandia, a crazy world of celebrity furballs, social petworking and four-legged lunacy. Shipping rates can vary depending on location and country. You can also choose to have your order sent via tracked delivery for a small additional fee. My tracking number isn't working, is there something I need to do? Please note that the Royal Mail can take up to 48 hours to log a delivery into their systems. Should your tracking information fail to register on the Royal Mail Track and Trace service, please wait 24 hours and try to track the item using the link once more. Can I order from outside of the Australia, Canada, Europe, UK and US? The book is currently available in English only but we hope to bring you multiple languages in the future. Woof! Is the book in US English or British English? The book has been written so no words that differ between the two languages are used. So the book is suitable for both YAY! Can I add more than one pet per book? Can you Petlandiafy other animals? We're all about cats, dogs and rabbits at the moment but Petlandia artists are busy working on new pets all the time, so watch this space. If you have any suggestions for new pets or colours, please get in touch. How do I submit my pets photo? We are afraid we do not base our designs on individual pets. We have a wide selection of different options to choose from as well as colours and markings. 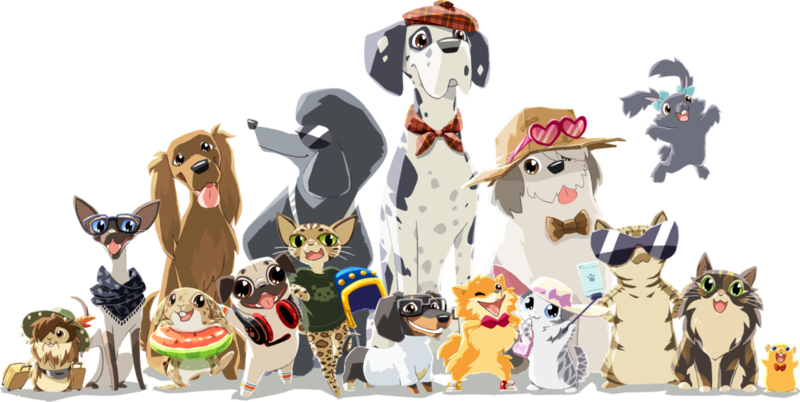 If there isn't anything close that resembles your pet, please pop us an email and we'll add your request to the list and share with the design team. What if I can't find the pet, colour or pattern that I want? We are constantly updating the type of pets available. Follow us on Facebook, Instagram, Twitter or Snapchat for all pet release announcements. I'm buying this as a gift for someone. Can I add a personalised message? It depends on what stage of the process your book is at. Please contact our customer support team and they will see if it's possible. Oops! I have made a mistake on my order, what can I do? Please check your junk mail folder. If you can't find it, then contact our customer support team. My delivery has not arrived, what can I do? Please contact our customer support team with your order number and they will get your missing order investigated. We have a set amount of time that we can investigate lost parcels. If you do not contact us within 3 months of ordering/shipping, we will not be able to look into your missing order. So please do not delay! There is a problem with my payment, what can I do? If you are not based in the UK, it may be that your card issuer is blocking the transaction, due to the overseas transaction. We suggest giving them a quick call and asking to allow the transaction to go through. You should not have any problems after that. Alternatively, you can still use your card via PayPal. If you are in the UK, please contact our customer support team and they'll be sure to help. Do you send a receipt/invoice with the orders? No, there is no paperwork within the order, your confirmation is your receipt. Don't worry the recipient won't know any of the details you want to keep hidden :). What happens if my book is damaged? Assuming the damage is not a result of your frisky pet tearing open the package, you can send us a picture of the damage and we will look into sending a replacement book. Because our books are personalised they cannot be returned, but if there has been a mistake with your order please get in touch with our customer support team and they will investigate. Ruff!